When an NServiceBus endpoint fails to process a message, it performs a set of configurable attempts to recover from message failure. These attempts are referred to as "immediate retries" and "delayed retries" and in many cases allow the endpoint to overcome intermittent communication failures. See recoverability for more details. If the automatic retry attempts also fail, the endpoint forwards the failed message to the error queue defined for all endpoints in the system. See Auditing with NServiceBus for more details. 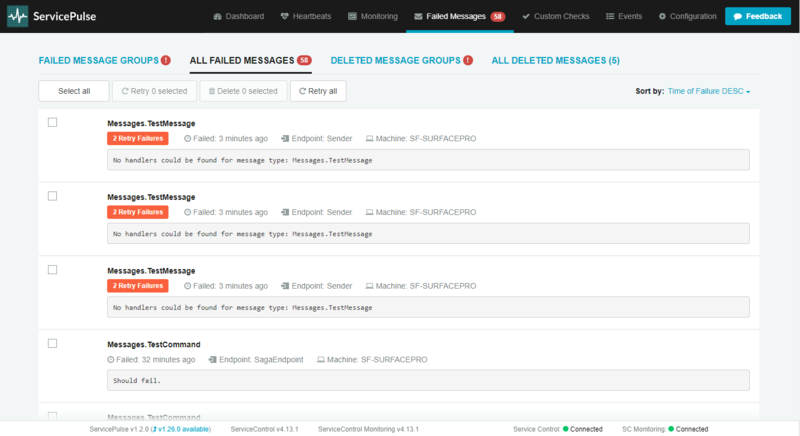 ServicePulse (via ServiceControl) monitors the error queue and displays the current status and details of failed messages as an indicator in the ServicePulse dashboard. Besides, ServicePulse also provides a Failed Messages page to assist in examining failed messages and taking specific actions on them. Both the "Failed Messages" indicator in the Dashboard and the "Failed Messages" link in the navigation bar link to the Failed Messages screen. This page is split into various tabs. The first tab in the Failed Messages page shows error groups. A group is a set of failed messages grouped according to criterias like the same exception type. This tab shows two lists, described below. This list is collapsed by default and shows information about the last ten completed group retry requests. A completed retry request represents a completed operation where messages from a given group were sent to the corresponding queue for processing. This means those messages may not have been processed yet. Learn more about retrying failed messages. This list shows all groups of currently failed messages. Exception Type and Stack Trace - groups messages both by exception type and stack trace. It is the default way of categorizing failed messages. Message Type - groups messages by message type. Endpoint Address - groups messages by endpoint address where the failure occurred. the number of listed groups may differ depending on the selected classifications type view. View messages - Shows all individual messages contained in the group. Request retry - Sends all failed messages to the corresponding queue to attempt processing again. When a failed group retry request is initiated, ServicePulse will present the progress of the operation. Archive group - Archives all messages contained in the group. Learn more about archiving messages. Both of these message list views allow for taking actions on an individual message, on custom message selections or all messages contained in the view. Retrying one or a few individual messages can be useful for testing system fixes before deciding to retry several messages in a group. This is because retrying several messages take a long time and queue other ServiceControl operations for longer than desired. Retry - Sends the message(s) to be reprocessed by the corresponding endpoint. As of version 1.8.0 and above, each message can be browsed to see in-depth details about a given failed message, archive or to retry that message. Individual messages can be accessed by clicking the respective entry in any of the message list views. Message metadata - Failure timestamp, endpoint name and location, retry status. 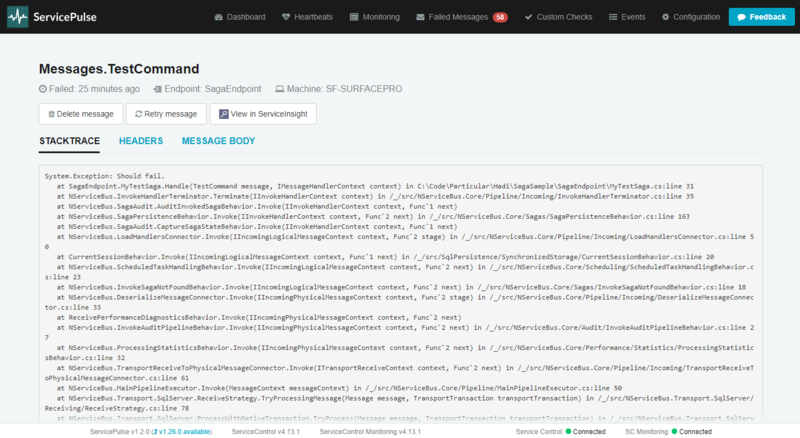 StackTrace - Full .NET exception stacktrace. Headers - Complete set of message headers. Body - Serialized message body. Retry - Sends message to be retried by the corresponding endpoint. Archive - Archives the message. View in ServiceInsight - Launches ServiceInsight, focusing on the failed message for in-depth analysis of the failure causes. This only works if ServiceInsight is installed on the local machine. The URL from that message's page can be copied to share the details of a specific message from ServicePulse. Failed messages that cannot be processed successfully (or could not be retried due to various application-specific reasons) can be archived and later viewed in the Archived Messages tab. Learn more about archiving messages in ServicePulse. 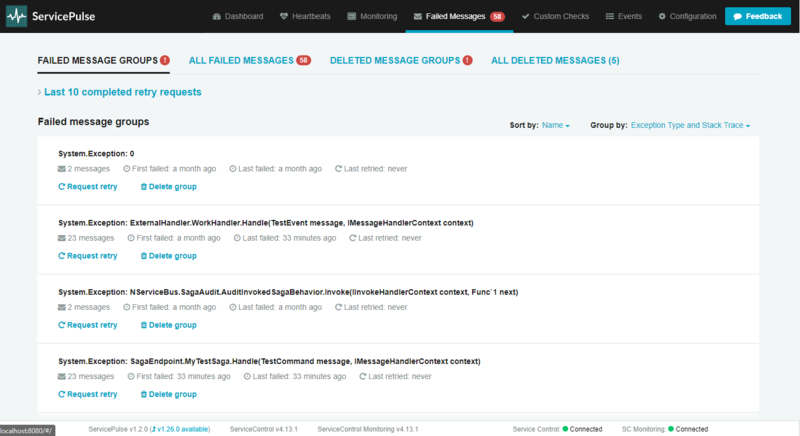 View the details of failed messages with ServiceInsight and retry them.